On Friday, at 8.31pm, the spacecraft Cassini will enter Saturn’s atmosphere, where turbulence will tear it apart. The pieces will melt and disintegrate as they race across the gas giant’s skies like a shooting star. After 20 years tracking the stars, the satellite is set to take its final journey into Saturn’s atmosphere. Country rejects a UN Security Council resolution imposing tough sanctions and warns the US will face the ‘greatest pain’ it has ever experienced. Former secretary of state Hillary Clinton was welcomed with applause at a Barnes and Noble store in Manhattan, where she signed copies of her new book ‘What Happened’. Longtime Trump aide Hope Hicks has become the youngest-ever White House Communications Director at just 28. Wests Tigers fullback James Tedesco has emerged as the surprise winner of the Players’ Champion award. Hundreds more Rohingya Muslims arrive in south Bangladesh, as the UN condemns Myanmar’s brutal security operation. Scientists in Australia are responsible for controlling the probe’s final descent, and hearing its final precious words. Many of them have been listening to the satellite’s broadcasts for 20 years. “We have been with Cassini since it opened its eyes on the universe,” says Glen Nagle, outreach lead at the Canberra Deep Space Communication Complex. Cassini, launched in 1997, has spent the past 13 years orbiting Saturn. It is the furthest-flung planetary orbiter humanity has launched. Perhaps its most amazing discovery is an ocean, filled with salts and simple organic molecules, existing on Saturn’s moon Enceladus. Along with another of Saturn’s moons, Titan, Enceladus is now considered one of the most promising places in our solar system to search for life. 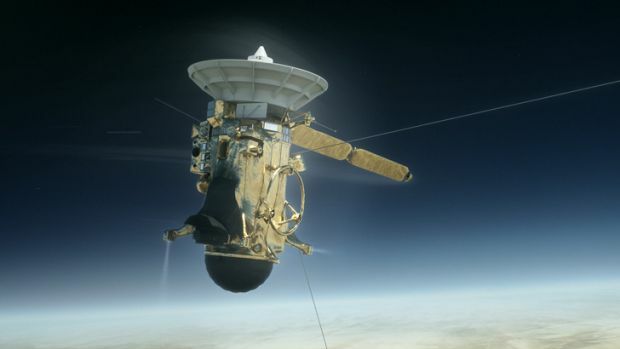 In finding the possibility of life, Cassini condemned itself to violent death. Disintegration in Saturn’s atmosphere means there is no chance any Earth microbes that may cling to the satellite could contaminate either moon. On Friday afternoon at 1.15, the Canberra space centre will take over tracking the satellite using two huge dishes mounted at Tidbinbilla, just outside the city. ​Canberra will be responsible for sending a continuous signal to the probe as it plunges towards Saturn. This signal locks into the spacecraft’s computers and provides a timing code, ensuring Cassini executes each manoeuvre at the right time. The code is accurate to trillionths of a second. Cassini will try to gather as much scientific data as possible in its final moments and beam it back to Tidbinbilla via radio waves. Instruments will try to measure the composition of Saturn’s atmosphere, its temperature and magnetic field. The scientists in Tidbinbilla are aware they only get a single shot at this. Things have been tenser than usual as they check and recheck systems for bugs and conduct dress rehearsals for Friday. Inside Saturn’s atmosphere, Cassini won’t burn. The planet’s -142 degree skies are far too cold for that. Instead, NASA says, it will be smashed into pieces by turbulence. Atmospheric friction will then heat those pieces to about 1300 degrees, and they will melt away to nothing. In the control room in Tidbinbilla, Australian scientists will hear the signal first waver, and then go silent altogether. “It’s been a daily part of our lives,” says Mr Nagle, who has been with this mission for 15 years. “And when that signal disappears – it’s not like losing a friend or family member. “It’s kind of like the last episode of your favourite TV show. You’ve watched this story for 20 years. And it’s not going to be there next week. After the signal goes dark, the scientists will keep their dishes pointed at Saturn for another hour and a half. Just in case an old friend has any last words for us.